Note: Mosaic wall created by Augustine Aguirre and Raul Curiel, sponsored by the Watts Towers Arts Center. 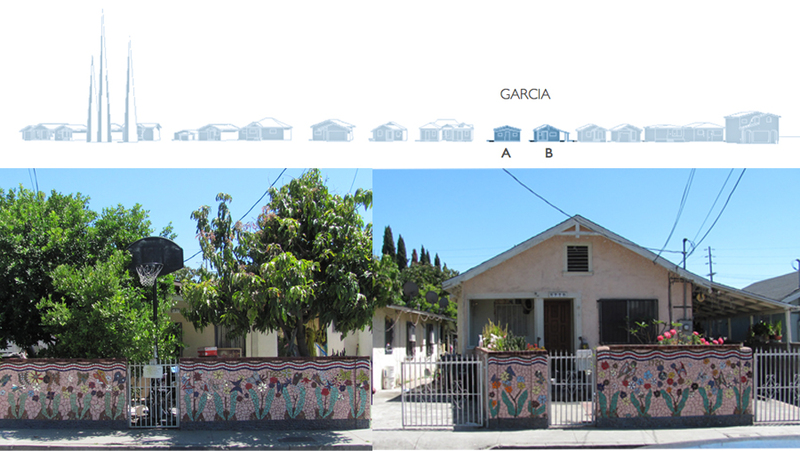 The Garcia compound consists of several structures that accommodate three generations of one extraodinarily tight-knit family. In a first step, the architects interviews multiple members of the family, surveyed the existing building to establish, and then map the various problems with existing buildings to establish the various problems with existing structures and infrastructures. The architectural interventions to the buildings and to the site are minimal, mostly addressing the problem areas identified. The architects’ intention is to help make a livable place for this family by adding necessary living space for the second generation members who co-habit the family compound, and amongst other things, remodeling the bathrooms and kitchens to keep them in functioning order. In addition to addressing these more mundane needs, the architects, in collaboration with the artists collective Slanguage, are looking to develop a distinctive identity for the family’s home through a series of interventions: one, a memory book tracing the family’s history in the neighborhood; two, an artwork in the form of a reliquary to enshrine the family book; and three, decorative architectural elements interwoven in the architectural fabric of the home. A new carport, doubling as an outdoor dining pavilion, serves as a communal gathering space for family festivities. Having lived there for more than 30 years, the Garcias are a pillar in the Watts community. They have raised four generations in their duplex home, and, as the family has grown, so too has their need for space and improvement to the property. Overcrowding has pushed one part of the family to inhabit the property’s garage, and insufficient resources, in addition to soaring energy costs, have led to the deterioration of the home’s interior, putting great stress on family life. To help the Garcias enhance their home and living conditions, WHP has partnered with Los Angeles-based artist collective, Slanguage, and the modern architectural design firm, EscherGunewardena.